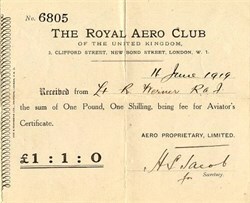 Historic SCARCE Aviator's Certificate Receipt from the Royal Aero Club of the United Kingdom issued in 1919. This historic document was printed by Ede and Townsend, Ltd. Printers London and is hand signed by H. L. Jacob for the Secretary and is over 86 years old. Initially confined to ballooning, when heavier-than-air flight arrived, the Royal Aero Club of the United Kingdom embraced it with alacrity. The Club established its first flying ground at Muswell Manor near Leysdown on the Isle of Sheppey in 1909. Early contacts with the Wright brothers in America by Charles Rolls and the redoubtable Short brothers, balloon makers to the Club, led to the latter acquiring a Wright license and laying down the first aircraft production line in the world, at Leysdown, moving the next year to Eastchurch. The influence of the Club in those early days cannot be over-emphasised. Its members included - and trained - most military pilots up to 1915, when military schools took over. The gift of training facilities and aircraft to the Royal Navy by Francis McLean was the real starting point of the Royal Naval Air Service. From 1910 the Club, which had been granted the Royal prefix that year for its achievements and status, issued Aviators Certificates, internationally recognised under the F�d�ration A�ronautique Internationale. As the United Kingdom representative on that august body, the Club was responsible for control in the UK of all private and sporting flying, as well as records and competitions; a function that, through the Aviation Council embracing some dozen national sporting and educational flying organisations, it fulfils to this day. It borrowed heavily from existing sports such as horse racing for its early regulations; the first air racing rules contained the injunction that "No rider shall interfere with another rider on the course". Initially closely allied to the Royal Automobile Club, the Royal Aero Club wandered through some seven premises before settling in its most famous home at 119, Piccadilly in 1931. Thirty-five years later, when the lease expired, it recommenced its nomadic existence. For most of its life, between 1906 and 1945, it was run by its remarkable Secretary, Commander Harold Perrin, known in the Club as "Harold the Hearty". A brilliant organiser and superb raconteur, he epitomised, fostered and encouraged the Members' natural bent towards enthusiastic, determined and argumentative individuality in the battle against authority to establish the right to freedom in developing Britain's remarkable lead in private - and public - aviation. On 14 October 1905 when the F�d�ration A�ronautique Internationale was founded in Paris, the history of human flight had already passed well beyond its infancy. No less than 122 years had passed since the Montgolfier brothers had begun the conquest of the air in their balloon. But at the dawn of a century that was destined to bring enormous progress, the creation of the FAI - just two years after the first powered flight of the Wright brothers - marked the beginning of a marvellous adventure, soon to generate a long list of pioneers, heroes, myths and martyrs. It was an adventure punctuated by major technical innovations and records of all kinds; an adventure also marked by legendary figures and by the imagination and the inventiveness of forward-looking men and women who were always ready to revolutionize the way they viewed the air and space. In the beginning were balloons, and then came aeroplanes, sailplanes, helicopters, parachutes, spaceships, hang-gliders, paragliders and microlights. Who knows what tomorrow will bring?... By exploring the atmosphere and what lies beyond in the last 100 years, the human race has tried to reach out some way towards explaining the mysteries of life. With over 200 pages and some 80 illustrations, "High Flyers" invites you to take an aerial view of a century of aviation achievements and progress in the air. Achievements that the FAI�s outstanding cast of determined and hard-working characters has recorded throughout the last century for the benefit of future generations throughout the world. History from Royal Aero Club of the United Kingdom.